The Musical Director works his choir as if playing a musical instrument. The flexibility it gives enables him to select music from every sector in the male voice repertoire, confident in Cantorion’s ability to meet the different challenges. Although relatively small in number the choir can handle work generally considered the preserve of much larger ensembles. This would include The Prayer (Lohengrin) – Wagner, The Lord’s Prayer – Mallotte, The Creation – Richter, Jerusalem (I Lombardi) – Verdi and Nessun Dorma – Turandot. On the other hand, it excels with the quieter, haunting melodies like Suo Gân and Bring Him Home, pieces which demand a gentleness of sound, lightness of touch and of most importance a close rapport with the integral solo parts. Inevitably, Cantorion enjoys performing its many traditional Welsh selections, especially in the ‘language of Heaven’! The quality of the top tenors and bottom bass, in particular, ensures that Welsh hymn tunes (e.g. Gwahoddiad – arr. J.T.Davies, and Buddugoliaeth y Groes – arr. 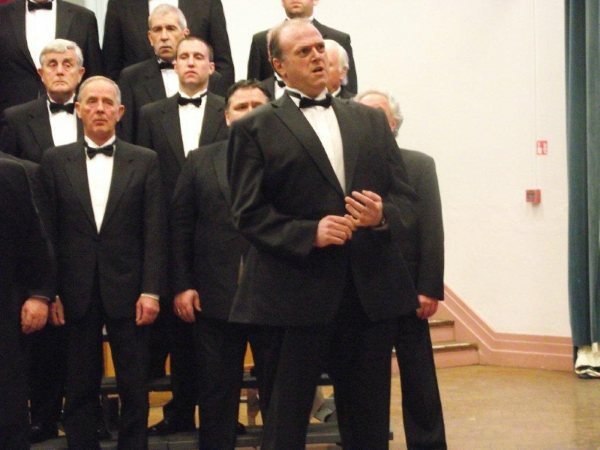 J.Raymond Williams) are always delivered with that essential passion, dynamics and hair-raising finale expected of Welsh male voice choirs. Other favourites designed to ‘trigger Hiraeth’ (a sense of belonging) especially in Welsh people everywhere include Y Ddau Wladgarwr – arr. C.Jones, (the choir’s signature tune), O Gymru – arr. Haydn James/Jennie Trew, Myfanwy – arr. Colin Jones and John Daniel’s very own arrangement of Sospan Fach. The Musical Director always seeks to change the choir’s tempo and momentum by including pieces to keep the toes tapping (Every time I Feel the Spirit, The Silver Trumpet). He has arranged a number of songs for the choir and the choristers are keen to perform his pieces such as Pan Fyddo’r Nos Yn Hir, The Impossible Dream and of course, Sospan Fach. The Musical Director is able to use the many soloists in the choir to great effect in concert, either as individual soloists between choir pieces or as parts within set choral works. Soloists choose their own pieces, usually set to complement the choir’s performances. Tenor arias and concert favourites vie with bass and baritone selections as well as with the established trio and duet contributions. The Musical Director follows simple guidelines in choosing choir and concert programmes. He is determined to select those pieces which the ‘boys’ enjoy singing and which the audiences love to hear. In so doing he wishes to protect what is already good in the Welsh Male Chorus tradition whilst promoting new and exciting work whether it is sacred, operatic, folk or popular. At the end of every concert Cantorion hopes that its performances have left the audience wanting more . . .